I did not realise the different depths to the word “Trauma” until I went to the Embassy of Israel Seminar on terrorist incident mass casualty trauma arranged by the Embassy on Friday 18th November. This was an august round-table meeting of the various London hospital heads of Trauma (or Accident & Emergency Depts. as it is called in the UK) and other first-line responder organisations. Prof. Avi Rivkind, Head of Trauma at Hadassah Hospital Jerusalem and a world-leading expert on this subject, made a presentation to the Seminar about the detailed medical system & action plan developed in Israel. Prof. Rivkind explained that it is essential that a planned response schedule is in place before any incident happens. He analysed the experiences of the various terrorist incidents;- the Spanish Train bombings, The Paris Bataclan incidents, the Boston marathon bombing, the Jerusalem bus bombings and the resulting actions and survival rates in terms of fatalities, casualties, and how and where the victims were taken to. He talked about the different type of medical traumas caused and how they are best treated on the scene and at the hospitals. There was some discussion as to first-line responders (ambulance personnel etc.) and the best method with regard to on-the-scene treatment and Prof Rivkind said that in Israel, only intubation and needle thoracostomy are carried out, nothing else, with a system of “scoop and run” to the hospital. Other first line responders such as police and the IDF in Israel also have their systems ready. It is inevitable that the nearest hospital to any incident will be where the first casualties are brought, even if they do not have the facilities. It is important that the casualties be distributed to multiple hospitals so that one hospital is not swamped and unable to give the best treatment. Any terrorist incident causes an initial situation of “Chaos” which all the planning is designed to reduce and allow the systems devised to quickly take over and be applied. The supervising Hospital Head of Trauma should not be in the O.R. but at the hospital door triage, supervising who needed an essential operation and who could wait. The patients are re-assessed and reviewed by the doctors all the time they are in the trauma unit. Immediately after the incident is reported, the emergency staff need to be at the hospital immediately, ready and waiting, and in Israel they set up additional Trauma wards in the corridors, which are specially designed to take any additional mass casualties. It was the medical debriefing (within 24 hours) after each terrorist incident and the comparing of notes with the other first response services in Israel, that had led to a complete and constantly updated methodology to most effectively deal with terrorist mass casualty incidents, to be able to save the most lives. Prof. Avi Rivkind’s presentation showed the Israeli model of an organised response to terrorist mass casualty incidents, showing the incredible thought, effort and system that has been put into a way to save as many lives as is humanly possible and most effectively deal with a large amount of injured effectively. Hearing about its detail was impressive, daunting and humbling. Prof Rivkind’s presentation was then followed by Sarri Singer, who made the unfortunate decision to take the No 14 bus in September 2003 and was followed onto the bus by a Palestinian 18-year-old boy who blew himself and the bus up. 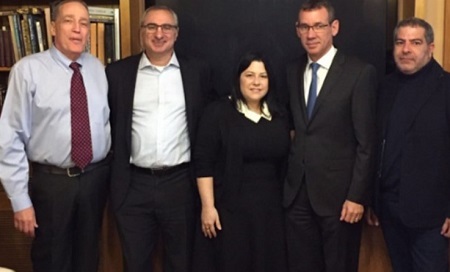 Sarri told her own personal story and how Prof Rivkind and his team at Hadassah saved her life. Her presentation illustrated to all the medical emergency specialists present, what was happening in the mind of the victim at that time. The victims are more than just a patient when they, the doctors, were working so hard to save them. This gave a unique prospective and helped medical staff understand the depth of the other side of the victims “trauma” a little more.